nature is the realisation of the simplestconceivable mathematical ideas. noughts: 100; 1000; 10,000 etc. 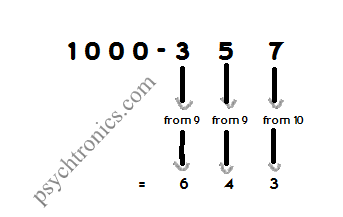 For 1000 - 83, in which we have more zeros than figures in the numbers being subtracted, we simply suppose that 83 is 083. Here “the last” is the 3 as zero does not count. So we take 2 from 9 and 3 from 10. Don’t know your tables? Never mind, in this system you don’t need them beyond 5 x5! The diagram below shows how you get it. 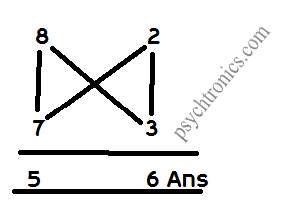 You subtract crosswise: 8 - 3 or 7 - 2 to get 5, the first figure of the answer. 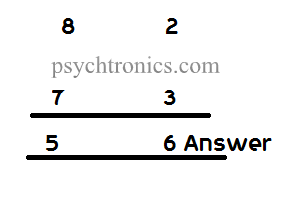 And you multiply vertically: 2 x 3 to get 6, the last figure of the answer. 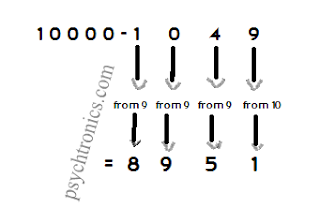 numbers together in your head. 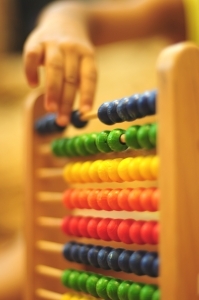 Here’s how to use VERTICALLY AND CROSS- WISE for multiplying numbers close to 100. Suppose you want to multiply 88 by 98. Both 88 and 98 are close to 100. 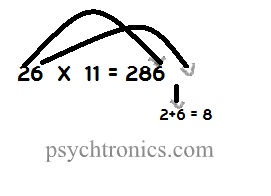 88 is 12 below 100 and 98 is 2 below 100.
just 12 x 2: you multiply vertically. by multiplying numbers just over 100. The answer is in two parts: 107 and 12. 107 is just 103 + 4 (or 104 + 3), and 12 is just 3 x 4.
your parents and friends with this. 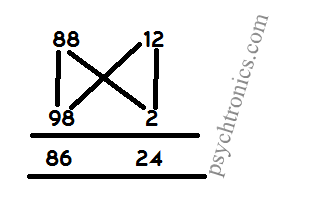 Notice that the outer figures in 286 are the 26 being multiplied. 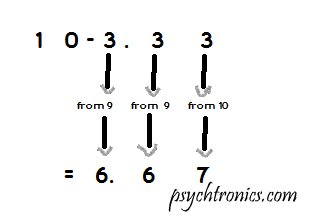 Follow more upcoming mathematics shortcuts that increase the performance of your brain cells and we will update with more shortcuts in psychtronics if this post response is good.